Written by experienced authors, the Coursebook provides comprehensive coverage of the syllabus. Accessible language combined with the clear, visually-stimulating layout makes this an ideal resource for the course. Questions and explanation of key terms reinforce knowledge; different kinds of activities build application, analytical and evaluation skills; and case studies contextualise the content making it relevant to international learners. It provides thorough examination support for all papers with exam-style questions with each chapter and an extensive Paper 3 style case study with each unit. The student CD-ROM contains revision aids, further questions and activities. A Teacher's CD-ROM is also available. Objectives set out the aims for each chapter. Key definitions enhance understanding of the concepts. Questions within each chapter help with practice and aid self assessment. Key concept feature integrates this new syllabus element with the text and highlights the links between different topics. Case studies from around the world put the subject in the context of real business situations. Summary points at the end of each chapter consolidate learning. Extensive case study at the end of each unit offer thorough support for Paper 3 style questions. 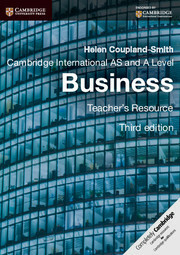 Helen Coupland-Smith has over 20 years’ experience in teaching Economics, Business Studies and ICT to A-Level standard. She is an experienced examiner, a highly experienced teacher trainer and conference speaker. In 2008 Helen gave up her full time teaching job to set up her own business; however, she has continued to work closely with teachers and students, in particular specialising in helping students improve their exam technique and leading innovative teacher training courses. 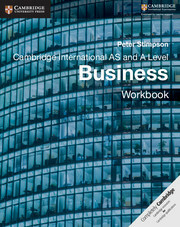 Alastair Farquharson has been an A-level Business Studies and Economics teacher for over 20 years. He is an experienced examiner and he also has experience of providing training for teachers overseas in A-level syllabus development, teaching methods and examinations skills. 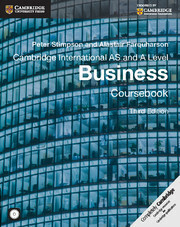 Peter Stimpson has over 30 years' experience in teaching Business Studies and Economics. He has been an examiner and also trains international teachers. He is the author of numerous Business and Management textbooks.